In my previous posts, I had explained about the features of S/4 HANA and the delta from SAP ERP to S/4 HANA. This post explains the process of conversion from SAP ERP to S/4 HANA. As explained earlier, the process of moving from SAP ERP to S/4 HANA is called system conversion. It is to be noted that this is not just a technical upgrade but involves some key decisions to be made before the actual conversion process itself. While decisions have to be made from a change management perspective as to if there will be any changes in the ways of working, some decisions related to the actual conversion process also have to be made before the process starts. For eg: Do we want to use Fiori? Will we have the same number ranges for the BPs as customers? What BP roles and BP Groupings should we use? These questions could involve quite a few stakeholders and hence it is recommended to have these discussions quite early on. You can also use the simplification list as part of the preparation to understand the impact. SAP provides a conversion guide for system conversion. You can have a copy downloaded with the link below for 1709 version. It is a very useful guide in the whole conversion process. It also has a list of useful links and notes which will be used during the conversion process. It is recommended to go through before the actual conversion process begins. 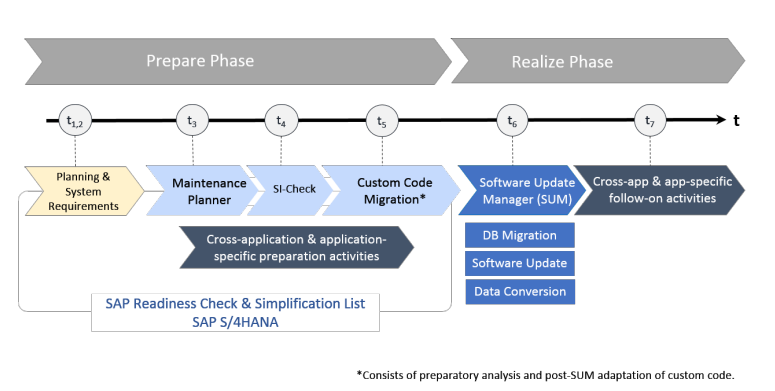 Below is the S/4 HANA System Conversion Sequence as mentioned in the System Conversion Guide. System Design, Architecture and Sizing, new hardware resources required? Dependencies on SAP NetWeaver Gateway / Front-End servers? 3rd Party Vendor Add-Ons are evaluated and checked if they are compatible with S/4 HANA for the respective version. There could be few roadblocks if not compatible and if necessary, same has to be removed of possible. This phase would involve the functional team to do the functional conversion activities. The report R_S4_PRE_TRANSITION_CHECKS is to be run to check if the prerequisites are met from the application standpoint. You cannot proceed with the conversion process if there are any errors. Convert Customers, Vendors to BP. Important note for this process would be 2265093 – S4TWL – Business Partner Approach. The note has details about how to set up and use CVI for the business partner conversion. The steps in the Business Partner Guide can be followed to complete this process. Report CVI_UPGRADE_CHECK_RESOLVE can be very useful during this phase. Activate Material Ledger. The note 2352383 can be useful for this. Material Field Length Extension. The note 2267140 can be useful here. Pricing Data Model Changes – Use the cookbook in the note 2220005 to take care of the custom code for pricing. Inventory Management Data Model simplification – The note 2206980 can be used as reference to complete this activity. There is a cookbook as well which comes with the note which can be useful for this activity. Run the program FINS_MIG_PRECHECK_CUST_SETTNGS for consistency check in ledger, company code and controlling area. This phase is an extension of t3. If there are errors in the report R_S4_PRE_TRANSITION_CHECKS because of custom code conflicts, you will not be able to proceed to the next step. Code Inspector can be used to identify the conflicts and remediated. Potential conflict areas could be Material Number Field length, Pricing, key tables like BKPF, BSEG, MKP, MSEG table enhancement, document flow and document status tables usage, CI_COBL, etc. Once the report R_S4_PRE_TRANSITION_CHECKS indicates that all the errors have been corrected. You can then proceed to the next step. This is the technical conversion phase. Follow the guided procedure of the SUM Phases. The below are the steps in SUM as per the conversion guide. Database migration (optional). If your source system is not yet running on the SAP HANA database, use the database migration option (DMO) of the Software Update Manager to migrate your database to SAP HANA during the conversion. Installation of the SAP S/4HANA software. Conversion of your data into the new data structure used by SAP S/4HANA (this is the automated part of the data migration). Run the Finance Migration activities. Note 2332030 can be useful for this. Configure and Migrate credit management. Note 2270544 can be used as reference for this. If you are using rebates, follow the notes 2267308 and 2226380. Activate necessary business functions and implement the necessary notes as mentioned in the note 2389807. This would conclude the conversion activities and the system can be released for testing after a sanity test if there are no issues.